Blame the newspapers, blame the internet, but we increasingly seem to live in a world where divisions are absolute. You’re either right or wrong, a Good Egg or Bad, with us or against us. This perspective ignores the fact that in a world of 7 billion people, there really should be a few different points of view. Shades of grey between the black and white. …except they weren’t, were they. Most people aren’t thugs who hate others for reasons of racist ideology. Most people are ordinary people who get swept up in the events of history. Portraying a Nation is about these ordinary people. It’s a showcase of two artists who are stylistically distinct, but thematically linked. Not that I’m entirely sure that August Sander would have called himself an ‘artist’. An artist-photographer usually starts with an intention of what they want their pictures to say, and chooses sitters to match these intention. Whereas the most striking aspect of Sander’s pictures is their objectivity. Sander’s photos are of artists and officials, farm boys and blind girls. These are the people who had lived through the First World War, were living through hyperinflation. And the room is dotted with dates and facts about the era, to help us understand this. But these photographs are statistics brought to life. The ordinariness of Sander’s photographs makes the evil which engulfed this society seem even more shocking. It’s impossible to tell who supported Nazi persecutions, who suffered, who took a stand. They remind us that hatred can come from anywhere, even as we have so much in common. 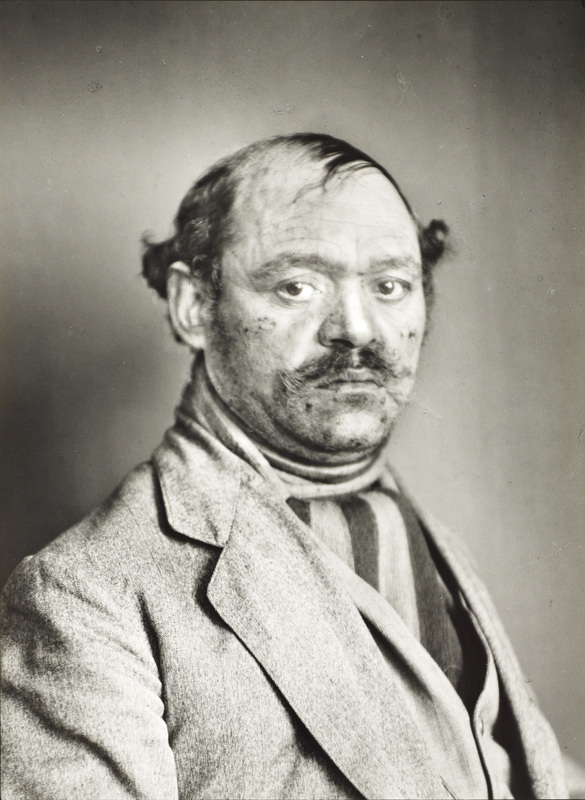 Many of these portraits were included in Sander’s book Face of Our Time, which was seized and destroyed by the Nazis. 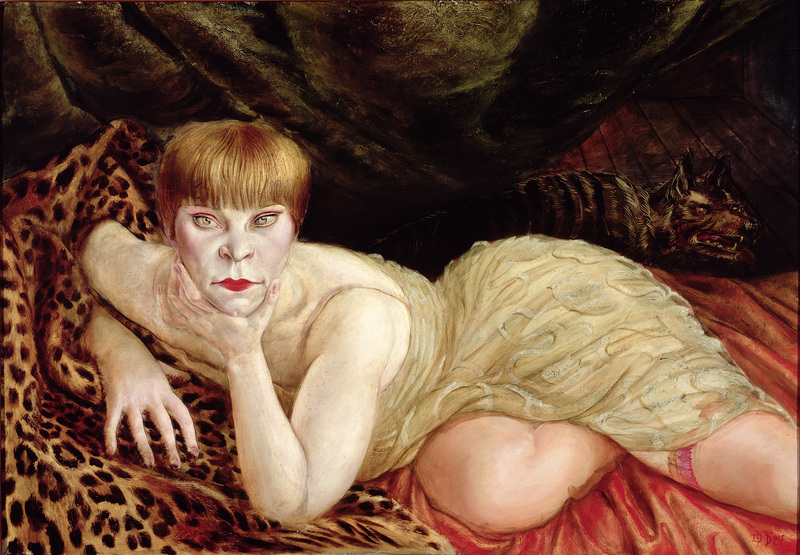 Otto Dix, the artist featured in the second half of Potraying a Nation, was also persecuted – labelled a “degenerate” artist and banned from teaching. Despite the huge contrasts between their styles, both Sander and Dix did what the regime couldn’t bear. They both show society as it was, rather than what those in power believed it should be. The soft, natural prints through which the show introduces us to Dix are quickly revealed as a false flag – turn the corner and things get very brutal indeed. Dix looks for the outside edges of the socially acceptable – murder, suicide, prostitution and poverty – and holds nothing back in his graphic representations. Sander’s portraits are more obviously objective, so why do I put Dix in the same category of not passing moral judgement? Well, quite a lot of the work here is based on Dix’s own experiences. He goes so far as to feature himself in some of the brothel scenes along the back wall. These are not flattering portraits – the the behaviour of the leering, groping men is generally as frowned upon now as it would have been then. But you can’t say they’re not honest. Or take his War series, to which a significant portion of the room is dedicated. They’re both literally and metaphorically dark landscapes featuring pock-marked fields, maggot-infested skulls – and drunk soldiers cavorting with prostitutes (kind of understandable behaviour in the circumstances). No wonder the Nazis hated him – these are not exactly noble soldiers fighting for a noble cause. I was less comfortable with some of Dix’s later works. By the series of portraits at the end of the room, the contrast between men and women seems less about truth and more about misogyny. The men are all suited, upright and respectable; the women sexualised nudes. It’s a shame to remind us that in the early 20th century, even when we’re talking about a pure or objective viewpoint, it’s still that of a patriarchal man. But overall, this is a fantastic show. When a time and place has been analysed and re-analysed as much as interwar Germany, it’s easy to feel like you know the story. But that’s playing into the stereotypes of Good and Bad that can be manipulated to persecute whole societies. By looking at the wider picture, Portraying a Nation re-humanises ordinary Germans and simultaneously without needing to be specific, clarifies where true evil lies. RECLINING WOMAN © DACS 2017. Collection of the Herbert F. Johnson Museum of Art, Cornell University. Gift of Samuel A. Berger; 55.031. 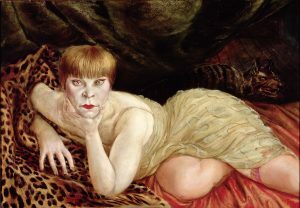 This entry was posted in Exhibitions, Home, Past exhibitions and tagged 20th century, art, Germany, painting, photography. Bookmark the permalink. ← We Are All Artists.